On a cloudy Sunday, a gorgeously graceful documentary is the greatest gift one could get. Bitter-sweet and highly emotional, „Standing in the Shadows of Motown” presents the one and only Funk Brothers, the unrecognized and uncredited musical backbone who played on Motown‘s recordings from 1959 up to 1972 that had far more number 1 hits as compared to The Rolling Stones,The Beatles, The Beach Boys and Elvis Presley combined. When you think you know a lot, there comes a smashing surprise, proving you know nothing! I rapidly read the documentary short description and it didn’t make sense. I didn’t understand how I could have possibly missed them. Were they an unknown band? Were they the ones who did the doo-wops? 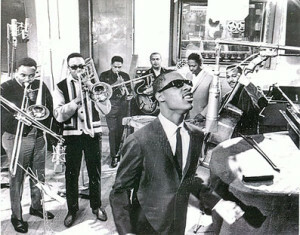 In fact, they were everything – the musicians of the ‘60s offering masterpieces day by day to the world. 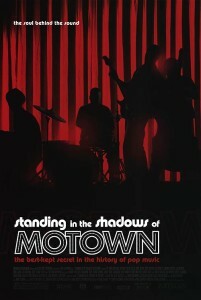 They were not a band, but all the bands of the Motown compiled. Whatsoever, The Funk Brothers were to change the history of music with their visionary, ingenious, fearless and prolific work. In 1959, Berry Gordy Jr. gathered the best musicians from Detroit’s thriving jazz and blues scene to begin cutting songs for his new record company – Motown. Over a fourteen year period, they were the heartbeat on every hit from Motown’s Detroit era. In 2002, 41 years after they played their first note on a Motown record and 30 years since they were all together, The Funk Brothers reunited back in Detroit to play their music and tell their unforgettable story, with the help of archival footage, still photos, narration, interviews, re-creation scenes, 20 Motown master tracks, and twelve new live performances of Motown classics with The Funk Brothers backing up contemporary performers. The documentary is truly remarkable, combining the joy of singing with a sentimental touch of nostalgia. I found out a lot of fascinating stories behind famous songs. For instance, they didn’t think that The Contours’ “Do You Love Me” will ever enter the charts. I love so many of their hits: “You Really Got A Hold On Me”, “Heatwave”, “You Can’t Hurry Love”, “Baby Love”, “My Girl”, “Reach Out”, “It Takes Two”. They were the great musicians behind hugely-famous voices such as The Supremes, The Temptations, Martha Reeves & The Vandellas, Marvin Gaye, Smokie Robinson or Stevie Wonder. Guitarist Robert White created the riff of The Temptations’ “My Girl”, probably one of the most recognizable guitar riffs of the early Motown days. Definitely this riff is among the top 5 guitar lines in history, together with “Satisfaction” or “Come As You Are”.